During slower moments when we're busy on our computers we turn to documentaries to help fill the dead air. A good documentary is engaging enough to keep us following the narrative but not too much so to distract us from whatever else we're working on. Their library includes a good mix of curated content from various sources and more and more new documentary features of their own design. Jeremiah Tower: The Last Magnificent is one such feature that touches on the culinary world, something that will always be fun to explore. Food-related shows are a dime a dozen these days, thus it becomes important to structure such a program in a way that keeps it somewhat distinct from others without being too odd or too strange. This film is a very thoughtful one that isn't even about the food all that much and focuses more on the story of this man who just happens to have been a key figure in the rise of celebrity chefs. Synopsis: Jeremiah Tower: The Last Magnificent is a documentary about the life of one of the first true celebrity chefs, Jeremiah Tower. The movie was directed by Lydia Tenaglia and is also available on Netflix. Jeremiah Tower is known to be one of the most influential yet also controversial figures in American gastronomy and was at the forefront of the rise of California cuisine culture. He is perhaps best remembered for the Stars Restaurant he established in San Francsico, which went on to become one of the most successful restaurants in the US and a regular haunt for Hollywood stars and other public figures of interest. But more than his rise, this story is also about his fall and how he walked away from Stars and essentially diappeared for decades. How someone could rise so quickly only to seemingly walk away from everything to go on a new journey is hard to fathom for anyone but this documentary tries to tell that story. 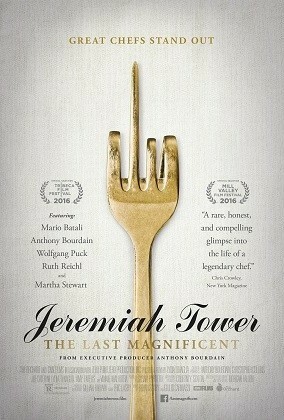 What I Liked: Jeremiah Tower's story is a most fascinating one and I totally get why they felt he was a subject worthy of film. Here's a man who helped bring chefs out of the kitchen and into the spotlight as it's not just what we eat but the art and thought that goes into the cooking as well. And it takes a certain sort of man to really start a shift in thinking like that. And the twist of his later life and how things changed is another key part in things, one that is perhaps best expained by his peers. The documentary also features many interviews of other key figures in the cooking world who share some keen insights into the mystique of Jeremiah Tower's unique place in American culinary history. What Could Have Been Better: This is a story about a man and not necessarily tied deeply to his work as a chef. He was known for bringing the Stars Restaurant to life but the movie will not go into detail about everything he cooked. It's not about techniques that he innovated or dishes that he was particular famous for, and that may be what most may expect from a feature like this. It is about a chef after all. Things get a little disjoint later on and there's a lot more opinion and speculation thrown about and less verifiable events and circumstances. This is sometimes good and sometimes confusing but it's neither here nor there. Some bits had value to me while others felt a little rambly. TL;DR: Jeremiah Tower: The Last Magnificent is an interesting documentary that helps one better understand the celebrity chef culture of today. He's a man with a most colorful history about him and it makes for intriguing watching. Thus the documentary gets 4 famous guests at the Stars Restaurant out of a possible 5.